A herbivorous species, Bagheera kiplingi, was described in 2008, but all other known species are predators, mostly preying on insects and on other spiders, although a few large species also take birds and lizards. Spiders use a wide range of strategies to capture prey: trapping it in sticky webs, lassoing it with sticky bolas, mimicking the prey to avoid detection, or running it down. Most detect prey mainly by sensing vibrations, but the active hunters have acute vision, and hunters of the genus Portia show signs of intelligence in their choice of tactics and ability to develop new ones. Spiders' guts are too narrow to take solids, and they liquefy their food by flooding it with digestive enzymes and grinding it with the bases of their pedipalps, as they do not have true jaws. 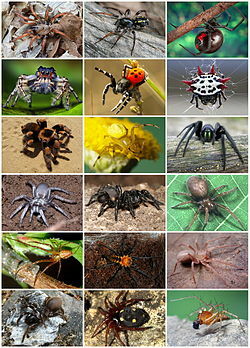 Male spiders identify themselves by a variety of complex courtship rituals to avoid being eaten by the females. Males of most species survive a few matings, limited mainly by their short life spans. Females weave silk egg-cases, each of which may contain hundreds of eggs. Females of many species care for their young, for example by carrying them around or by sharing food with them. A minority of species are social, building communal webs that may house anywhere from a few to 50,000 individuals. Social behavior ranges from precarious toleration, as in the widow spiders, to co-operative hunting and food-sharing. Although most spiders live for at most two years,tarantulas and other mygalomorph spiders can live up to 25 years in captivity.